learns what and who the most important things in his life are” (GSC Movies). Verdict: This is definitely one of the very few films of 2011 that has a brilliantly written screenplay. 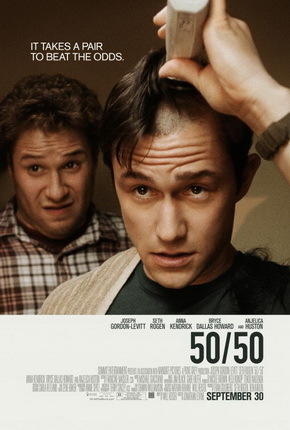 Unlike any dramatic and emotional cancer movies, 50/50 takes a very different approach by being absolutely hilarious with an attempt of inspiring cancer victims to stay positive. The film’s portrayal of the psychological stages of Adam, from knowing to realisation with the volcano theory as the metaphor, is convincingly honest and not cheesy at all. The acting performance of the cast is also quite impressive. And it’d always be a plus-point to hear a couple of my personal favourite songs in a movie. Moral values: See a doctor as soon as you feel abnormal pain so that if you did find out that you have something, at least there was still time. If there are things you wanna do but haven’t, go do it before chance runs out. And appreciate your parents. They may be the most irritating people in your life but they are the ones who care for you the most. with him throughout the entire ordeal. If… Adam doesn’t drive because road accidents are the 5th highest cause of death, how come he still travel by bus and cars throughout the film? Malaysian censorship: Profanity is completely uncensored. Actually, I don’t think there’s any important scene cut at all. How often do we get this here?! Highly recommended to be watched at the cinema. nice .. 50/50 it shall be for my next couple of movie watches.. It's good? I saw the trailer few weeks ago and planned to watch it.. Now with your review (and I know you review things critically like I usually do.. hahaha), I can go watch this at the cinema and not feel like I'm gonna waste my money.. Yeay!